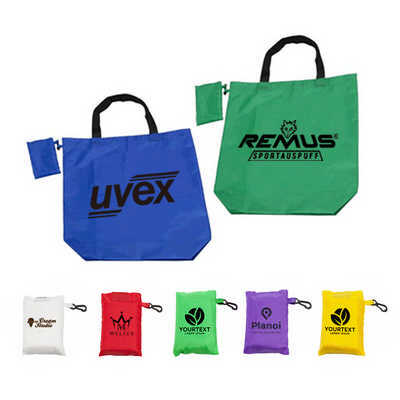 Foldaway shopping bag with knot can be custom branded with your corporate logo printed onto the branding area. Foldaway Shopping Bag make great promo products for grocery stores, that will enhance your company¡¯s brand awareness every time they are used. The bag includes a knot, ideal for hiking and any outdoor activIts. Material - 210D Polyester Colours - Red, Yellow, Blue, Purple, Black, Green, Orange, Magenta, White, Over 20+ colours, please contact us for more options Product size - Unfolded: 38 x 60 cm, include handle 170mm(H) Folded: 7 x 12 cm Gusset: 8cm Print size - Unfolded: 260mm(W) x 350mm(H) Folded: 50mm(W) x 85mm(H). Price includes : 3wk 1 col/pos print. Setup is included.